Most of the slot providers we review are well-known and offer games on almost every online casino you can think of. Sometimes however, we come across a lesser known provider which amaze us, and we simply have to spread the word. Habanero Systems is a one of them. Whilst this name might not ring a bell with most of you, the company has been around since 2012 and created more than 80 slots since that time. According to their website, they have a clear focus and like to keep things simple and provide pure gaming entertainment. We decided we had to see this for ourselves and, since we didn’t know much about them, dove into the world of Habanero without any expectations, but boy did they surprise us! 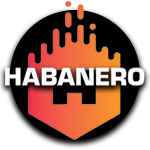 Habanero was founded back in 2012, and although they still are still a relatively small company, they now have offices located in Europe, Asia and Africa. Being a small company allows them to work and communicate faster than some of the larger game providers, and come to decisions a lot quicker. One of their core values is to keep things clear and simple. This translates into beautiful games that are full of excitement, but always easy to navigate and very user friendly. They are very consistent with delivering, and add new games on a monthly basis. Besides providing casinos directly with high quality games, they also work closely together with several aggregation partners and white label solutions, such as Slotegrator, Every Matrix and iSoftBet. The game provider is always expanding in new markets, and it seems like 2018 is going to be their best year so far. Late 2017 the company appointed Arcangelo Lonoce as the European Head of Business Development, who has kick-started their European presence with an expansion in Italy. Italian customers can now enjoy Habanero’s games thanks to their certification from AAMS, an Italian regulator. Since the company started, they have launched more than 80 slot games, 10 table games and 10 video poker games. All of which work on any device so that players can enjoy them anytime, and anywhere. They only create games that run on random number generators, meaning that the outcome can never be predicted in advance. All games exclusively use HTML5 to ensure the best possible customer experience by eliminating the needs of using flash. With more than 80 (video) slots, and another 10 coming up this year, it’s safe to say that Habanero has built quite a nice selection to choose from. The slots have a wide variety of themes and functionalities, but one thing becomes clear very fast when looking at their slots – each one of them has stunning graphics. The art team from Habanero is very skilled, which manifests in beautifully drawn characters and animations. The variety of themes ensures that every player will find a slot suitable for them. Whether your looking for a pirate themed slot, want to meet Zeus, join a gangster squad or want to run from a zombie apocalypse, they have it all. The table games selection currently counts 12 tables, which consists of a variety of Blackjack, Poker, Baccarat, Sic Bo and Roulette games. In the Video Poker selection one can play popular poker games like Jacks or Better, Deuces Wild and All American Poker. Beside providing both casinos and aggregaters with their games, they also offer a wonderful platform which allows casinos to manage bonuses, jackpots and much more. As we mentioned before, one of Habanero’s core company believes is that their games should be easy to use for everyone. We’ve taken a look at numerous of their games and can confirm that even first time casino players will have no issues using their slots at all. The information button located in the lower left corner of each game will provider players with detailed information about the game features and pay-outs. To give you an idea of what you can expect from Habanero Slots, we’ll briefly discuss a couple of their popular games. The first slot that we tried out was immediately a hit for us. Presto is a magic themed slot with 243 win ways, where a magician and his beautiful assistant will give you the show of a lifetime. One of the most interesting things in this game are the illusions. The top right corner will display between 5 and 19 feathers. After each spin, one of the feathers will disappear. Once no feathers are left, one of the illusions will be activated. These illusions can randomly activate functionalities which will add Wild symbols, sync several reels together in order to land identical symbols on them, or award re-spins. Another slot worth mentioning is Panda Panda. This game is perfect to wind down after a long day, as it plays calming background music and set in beautiful Asia. As the title of the slot gives away, the main character of the game is a fuzzy panda. The Panda symbol can, after each spin, randomly turn into a double panda symbol. This is a feature that you will find in multiple Habanero slots, such as Fortune Dogs. The last slot we want to mention is Bombs Away. With a 40’s war style complete with pin-up girls, this slot has a strong vintage vibe. Bomb symbols will explode, and as a result turn numerous surrounding symbols into Wilds. When hitting 3 or more Scatters appear anywhere on the reels, 10 free spins will be activated. Additional bomb symbols will be dropped randomly, and award extra Wilds. At the end of the free game, players have the change to win a progressive jackpot. This is triggered at random as well, and winnings are added to the other wins.